How do you define yourself? In what manner do you place invaluable worth within the construct of your entity? Does your ethical and moral equilibrium work in unison or react systematically to influences that register as individually exclusive transitions from one neurological asset to the next? How you approach your path and coincide with the conclusion of your actions exemplifies the attributes that compose the individual you are. The premise of enabling the practice of investing in periods of self-contemplation is key to assembling the necessary tools you'll need to harness the strengths that's embedded into you. The period of diverging your present thoughts away from all the noise that surrounds you predicates what's essential to the journey. It takes little to distract the senses when we have an abundance of external stimulus that co-exists within our existential landscape. For a brief moment, you dip into the finite resource of time and let the weight of your current responsibilities lay aside to the train of thought that will briefly occupy your attention. What I'm explaining is the basis of meditation. I'm a firm advocate of mental maintenance. Throughout my journey of understanding and developing the framework of my being, the emphasis of prioritizing psychological hygiene has emerged as a crucial practice that's provided the help I require to continue my progression most optimally. With the initiative of partaking the course of self-awareness, it'll demand an ample amount of energy that only you can exert. External influences that provide positive feedback stokes the flames of inspiration, but to a restricted degree. You are the creator of the infrastructure that'll facilitate the inner vitality obligated to motivate decisions into actions. The reservoir that accommodates the volume of demand to sustain your vision needs the proper threshold to supply the fire that's burning inside of you. Mental wealth is a critical element for the wandering light of consciousness. My interpretation of this theory is this; in order to harvest the consciously indispensable assets you'll use throughout the decisions you'll make, the importance of having a mindset prepared to deal with unexpected moments of adversities will undoubtedly maneuver the mechanism of personal progression function to your advantage, and not the other way around. LOCATION: SOOKE POTHOLES PROVINCIAL PARK. VANCOUVER ISLAND, BRITISH COLUMBIA, CANADA. Where can a journey lead a light of consciousness when the spark of creative flow surges the creative energy into the cerebral infrastructure that governs thought into creation? When the entity initiates its preliminary step towards the inauguration towards self-fulfillment, the outcome from that action can produce an abundance of alternative states of existence which might not be perceived within the host's intentions. The joy of attaining preset objectives is rewarding for the skillsets that you gain, but it's also substantial to realize the knowledge of knowing that you're getting one step closer to your goals. These attributes paired alongside all the various experiences that you'll see throughout your travel endeavor will be an adventure that you'll remember for the remainder of your time on this plane of existence. Throughout my journey of attaining self-awareness in my time of introspective evaluation, the search of finding what I believe is of imperative value and overall serves as the bases of what's best for me has been enlightening. The process of dedicating my full attention of the finite resource I have which is time on this earth has provided the structure I need to justify and delegate what's essential and what isn't. The practice that I've been implementing in my daily routine has come with trials of adversity that left me in ruins of inspirational despair. The horizon that faces our sight harbors circumstances that we can't anticipate, let alone understand within its fortuitous presence. I've dealt with these moments to the best of my ability, and the results have contributed to the individual that I'm slowly becoming. Make a conscious effort to retain the fragments of information that you'll be fortunate to be exposed to. When we contextualize the ideal itinerary for ourselves, we rarely factor all the challenges our endeavors require from us from a mindful perspective, and how the landscape and all the sociological infrastructures exist in our proximity will affect our overall progression. All we can do is attempt our very best in the present situation with the assets that we hold in each other. Be open and receptive to the environment that you inhabit. It along with all living entities that lay before you all have a story and a lesson to tell. Utilize the strengths you hold and with patience and effort, create the path that you want to pursue. Where it will lead, you will become the individual you're meant to be. LOCATION: FRENCH BEACH PROVINCIAL PARK. VANCOUVER ISLAND, BRITISH COLUMBIA, CANADA. "FIND A PLACE INSIDE WHERE THERE'S JOY, AND THE JOY WILL BURN OUT THE PAIN. "-JOSEPH CAMPBELL. My form of escapism has gravitated towards nature. When the fire of inspiration has dimmed down from the lack of periodic states of flow, the assurance that lays in the ecosystem that harbors the light of consciousness always provides a means of creative continuity. The peripheral horizons that lie within my mental landscape require the energy of subconscious connectedness to occur. The reaction manifest my perception of the present moment in engagement. What follows from this becomes the journey that I earn to capture and understand. My intentions of devoting my time to fabricating various forms of creative endeavors are centered towards fulfillment and personal growth. My periods of affirmation initiated when I found joy in the process of constructing mere thoughts into multisensory stimuli. My focus cascades from a state of conditioned cognition to a plane of wonder with endless boundaries for my imagination to explore. The separation from living in a societal construct that leaves little in relations to discover one's self can cause detrimental barriers that can take time to repair. Mediocre lifestyle illustrations start to unfold, and the results can vary. There's the scenario where you accomplish what others want you to pursue, but the only return you receive from the exchange is the act of delighting everyone except yourself. Or the individual that wanders without the necessary assets to help guide them through their journey. Or my favorite, the individual that claims they have what it takes to invest into their supposed strength or passion when they oversee the amount of discipline and commitment demanded from such an act. These are only a few examples among many that contribute to the infrastructure our existential light of consciousness inhabits within. The sheer amplitude of the daunting undertaking we face requires and demands our utmost attention and focus. We don't take our first breath on this plane of existence knowing what our purpose is. We create it as we grow mentally and physically. As we expose ourselves to the various and wondrous features that exemplify the beauty that surrounds us, the more susceptible our subconscious beings enrich our cognitive perspective in the present moment. Open yourself to the world that's waiting for your heart and mind to embrace its infinite wisdom. Provoke your curiosity to expand your depth of knowledge to assimilate the assets that provide value in your journey. And create the individual that you want to become. When you find yourself wandering in nature instigating your inner senses as I do, the results can be beautiful. "HAPPINESS IS NOT SOMETHING YOU POSTPONE FOR THE FUTURE; IT IS SOMETHING YOU DESIGN FOR THE PRESENT. "-JIM ROHN. The act of inspiring and retaining happiness within the light of consciousness is a challenge faced against adversities within the landscape it exists in, and the mindset that correlates within the plain of existence. The practice of conditioning the neurological infrastructure that's embedded in the center of our journey regulates the course that we pursue. The investment of time accentuated with the eagerness of progression towards personal growth manifests an energy that can only be contained when it's acknowledged and given the light of day. Placing the necessary measure of focus onto the perception of self-fulfillment requires a discipline and commitment determined by your intentions. What do you want to reach? Where do you want to go? What is it that you want to accomplish? My memory serves as an archive entrusted with experiences and lessons that I can utilize as references for future endeavors to come. The junctures along the threshold of the unknown occupy inquiries that need to be discovered. The position I bespoke myself from an earlier period of my life has changed from the present form I've become. Continual development encourages such acts of divergencies to facilitate to the ever-evolving light of consciousness. Without the opportunity of encountering new and unfamiliar offerings from our plain of life, the objective results of hindering our ability to expand our mental horizon heighten at a higher risk. All of these questions result to discerning what you want for yourself as an individual, and for the goals that you want to attain. The queries give action towards unbiased subconscious susceptibility, a manner of opening your perception to something more. The very premise of establishing a mindset to function in a way that initially derives from an upbringing lacking the fundamental understanding presses as a limitation. A limitation that is oppressive only if one lets it. Taking the first step in accepting the introspective rewiring that'll take place is no small feat to partake. Time is a finite resource for all of us, but I genuinely believe it is well invested when it comes to delegating what your priorities should be. Treat your mind as the most vital element in your present existence. When you implement the practice of self-awareness in your life, aspects like happiness are sure to follow. LOCATION: CREYKE PARK. SOOKE, VANCOUVER ISLAND, BRITISH COLUMBIA, CANADA. BEHIND THE CAMERA LENS-REMEMBERING THE PRECIOUS MOMENTS. I have had the fortunate experience of growing up on the East Coast of Canada in the province of Nova Scotia. The maritime landscape is a diverse natural playground for children of all generations to enjoy. I can recall vividly the sounds that the ocean made while it crashed against the shores or the smell of the salty air on a foggy summer morning. In my 20's I decided to move to the prairies in Alberta where I left those memories aside to surround myself with another beauty that was unfamiliar to me. The vibrancy of the summer fields that seem to go on forever paired with the Rocky Mountains became my escapism. I still recall the first time I saw the Rockies and be utterly awestruck of the sheer size and intensity the landscape provided. I instantly fell in love with the natural beauty that was waiting for me to explore. A decade later I find myself on Vancouver Island, reminiscing on these fonds memories while creating new ones. The more I push myself towards creating the individual I want to become, the more the sense of adventure presents itself along the way. We exist for a finite amount of time with the light of consciousness embedded into each of us. Make the most of what you have, and take on the chances in reaching the person you want to become. LOCATION: GOLDSTREAM PROVINCIAL PARK. VANCOUVER ISLAND, BRITISH COLUMBIA. "CHANGE BEFORE YOU HAVE TO. "- JACK WELCH. The premonition of change in one's life inspires emotions to act in a manner based on the conditioning of the individual and the environment that surrounds her. The course of the light of consciousness will partake in various trajectories throughout her journey in life. The vast landscapes that are waiting to be explored will undoubtedly require measures beyond what's been predicted from her former notions and intentions. The horizon we face harbors many stages of adversity in micro and macro phases that'll provide lessons and experience for one to witness. Change must be embraced when you take your last step from one mark in your pathway to the next. There has been a period in my life where I didn't grasp the concept of change. The practice of being open and receptive to diversity translated in disruption in the trajectory I've chosen to pursue. As far as I was concerned, I've developed the bedrock and the framework that would support the creative endeavor I fixated my focus and mind onto. Where can I go wrong? If I place a tremendous amount of thought and practice on gaining the mental capacity to create the visions I had, eventually my return on investment would pay off. Now, by all means, this isn't a terrible notion of carrying throughout the prerequisite terms of one's personal goals. The concern I want to shed light onto is with embedding a strong sense of focus at the task at hand; it can close the outlets of potential opportunities to present themselves within your phycological subconscious landscape. By instilling a broad ethical understanding of what your objections are, there has to be room for change. The premise of acting towards change can be a rewarding event. With a vast array of wisdom that can be cultivated from taking a chance, the aftermath leaves you to question yourself, "Why was I so afraid/concerned about not wanting to do this in the first place?" In the unknown thresholds that we'll cross in our lifetimes, there are valid reasons why you should acknowledge your apprehensive subconscious mindset. It's brought you this far in life, hasn't it? With that in mind, take the initiative to consider looking at the inquiry presented to you in a separate interpretation. What if you did take the chance and the results correlate with the next step destined to aim your perspective towards the right direction. A healthy amount of caution and curiosity can go hand in hand in the journey of the light of consciousness. "TO GO OUT WITH THE SETTING SUN ON AN EMPTY BEACH IS TO TRULY EMBRACE YOUR SOLITUDE. "-JEANNE MOREAU. The ability to share our lives with someone is a blessing we should be fortunate to attain. The meaningful conversations exchanged creates the bedrock for each light of consciousness to stand on. The spark of passionate emotions partakes into the motion of the heart and minds to merge as one. The precious moment's juncture into memories fabricates a story that'll last a lifetime. The limitations of the unification of two individuals are restricted only by themselves. The possibilities are endless when everything correlates towards a similar destination. Not all is lost if you're alone on your journey in life. Taking the initiative to delegate time for yourself can go a long way. For the last several years I've made an intention to place focus on myself and recondition my mindset to operate in an optimal state within my present state of being. With each passing year, the singular entity I once was slowly lost touch with the continually evolving society we reside in. To acknowledge what needed to change, I took it upon myself to leave my present conscious perspective and open my mind to the wonders that waited for me to be discovered. Travelling became my method of the inauguration of the past I was leaving behind. Stepping into the unknown, the horizon that faced my path emboldened my spirit and animated my subconsciousness. The experiences I've gained from being abroad on my own taught a plentiful source of insight towards the entity I could become. In the space of mental trepidation I once endured, the outcome of taking a chance became a pivotal point for myself and my journey towards my sense of fulfillment. The importance of understanding yourself attenuates anxious thoughts to course away from your objections. Focus and determination can only bring you so far. Having the ability to anticipate the optimal decision when stricken by adversity becomes vital when progress is required. The campaign of self-awareness is a challenging journey to embark. The act of remodeling your modes of thought process requires time and patience to restructure. When you gained clarity from the perspective of your goals and acquired the necessary assets to commence your journey, that's when your mind and body are prepared to step forward and walk towards the unknown horizon. All of these actions can start with placing your focus on yourself. When you open the possibilities to a receptive mindset, the journey is endless. And all of this can be done by yourself. It's about creating the entity that you want. Once you've attained a practical understanding of your present configuration, the sense of purpose becomes vital in your search for a better you. LOCATION: MIRACLE BEACH. VANCOUVER ISLAND, BRITISH COLUMBIA, CANADA. "THERE ARE TWO GREAT DAYS IN A PERSON'S LIFE - THE DAY WE ARE BORN, AND THE DAY WE DISCOVER WHY. "-WILLIAM BARCLAY. The wonder of creation captivates our imagination in a channel of emotions corrugated to fuel the heart and mind. The drive accumulated throughout these signals propels the conscious entity to exist in our plain of life. We gravitate towards the unknown horizons in a blind trust to potentially fulfill our desire to understand more about ourselves. The misfortunes that can arise from instigating that first step onto an unfamiliar threshold bares both little and devastating consequences. In the end, your left with the question of what probable experiences you've learned from your situation. These moments are critical. Without adversity how else are you going to discover and initiate your goals? How do you know your on the right course? What choices do you have when all you feel is confused and lost? These questions and the junctures that follow become the natural course you'll take to discover your potential. The formation of our light of consciousness is a remarkable feat of nature. The complexity of our minds joined to the mechanical infrastructure that is our bodies produce the continuation of our evolutionary progression that has brought the light of consciousness to where it is today. With the societal changes that have occurred, we've grown to live alongside the movement. With every piece of technology that's been produced brings us one step closer to contribute and administer an optimal passage of living. With every unfortunate mishap that occurred in our history, there's always a takeaway from the aftermath of the situation. The act of creation will appear throughout our lifetime and remain in motion until the light of consciousness extinguishes. As the search for self-worth becomes a priority, the course of attaining and developing all the preliminary tools to help guide you will serve an essential role for the continual steps towards the unknown horizon. Only with experience and time can you discover and embrace the value you can provide. Only with trial and error can you materialize the feelings associated with an adverse involvement that's not within your favor to then use it as a tool to delegate future hardships that you can avoid. Only with taking the initiative to apply everything mentioned above, you place the likelihood to succeed at your goals higher than if you didn't try at all. Let's take advantage of the life that we are given, the world in which we can explore in, and the wonder we can pursue to provide fulfillment for ourselves. "THE ONE EXCLUSIVE SIGN OF THOROUGH KNOWLEDGE IS THE POWER OF TEACHING."-ARISTOTLE. The opportunities of offerings we receive throughout our journey to the unknown horizon can translate into disparate content for our minds to embrace. In some instances, we encounter forms of adversity that present themselves with little to no warning. Our subconscious operating systems processes the scenario to the best of its ability, but with limited resource, the mind naturally instigates preliminary functions to learn the mechanism of the challenge it faces. We as the light of consciousness with a curiosity insistently producing inquiries have a natural sense of focus when it comes to gaining knowledge. It's provided a means of survival and existential sustainability for as long as our species has walked this earth. Without the capacity to resite patterns for a multitude of diverse actions, we might not be on the plane of life the way we've come to recognize in the present moment. The premise of accumulating the optimal assets of knowledge to apply towards your journey has the equivalency of a whole new adventure. We commence from having a weak understanding of the infrastructure that retains the light that we seek, and it's on our time that we have to comprehend the principles of the code that creates the education that we try to find. The disadvantage of having little to no familiarity or awareness becomes apparent as you push towards the strange landscape. The outcome can result in various endings. There's the possibility that you'll prevail with everything that is you intact, and there will be the moments of despair and confusion that'll test your overall state of consciousness. Enacting the function of being self-aware of yourself and your surroundings instills one of the different practices that'll become vital as the course of your life progresses. Every step you place physically and mindfully is one step towards understanding what you can provide for yourself and to the people who surround you. The priority you carry inline with your progressional growth predicates the outcome of the results your attain. The value of knowledge is priceless. The instant you have the competence to discern fully the question that lies in your way, the better your ability to reconcile the focus you place on the challenges and the success that you'll eventually receive. Knowledge is power. Knowledge is everywhere. Knowledge is the key to help you achieve the light you've always wanted. LOCATION: STRATHCONA PROVINCIAL PARK. VANCOUVER ISLAND, BRITISH COLUMBIA. CANADA. "YOU CANNOT SHAKE HANDS WITH A CLENCHED FIST. "- INDIRA GANDHI. The emotional pallet that we possess has a governing control over the actions that we take. The receptive measures arranged subconsciously in our minds justify the outcome of the adversity the light of consciousness encounters. One of the preliminary emotions that I've dedicated a strenuous amount of my focus on is patience and anger. My journey of pursuing my creative entity has confronted its fair share of challenges. In the moments of stepping onto the threshold of uncertainty, my susceptible behavior became divisive between my present mental state and my overall objective intentions. In these periods of restructuring and conditioning my perception, I recognized that to comprehend my optimal state of operation; I needed to search into myself and attain the necessary building blocks that'll support the operating system to carry me through my journey. The act of reacting with immediate and intense energy is understandable when the action we examine the nature of our predecessors that walked within a period and landscape different from our own. The instinctive sensory input that idled, waiting to engage at any moment, were greatly more attentive than ours. The rapid change from static to ballistic couldn't afford any delay. Survival of the fittest and the competent served as biological codes that create the infrastructure carried over from generation to generation. The information embedded into our genetics is vital for the continuation of our plain of life to exist. As the progression of innovation evolves, we have grown from the trials of trepidation our ancestors had to endure to carry on the light of consciousness towards a whole new horizon. Change is inevitable. How we adapt and grow within the societal and natural progression in these periods of divergence correlate the prosperity an entity can achieve. Throughout my developing progress towards my cognisant self, I've come to learn my boundaries and my capabilities. I acknowledge that I have my limitations and my strengths. The drive behind my creative endeavor derives from a part of me that I've developed for as long as I can remember. My attempts of capitalizing on my creative self open potential opportunities to arise and challenge my weaknesses. When those moments of hardship present themselves, I've concluded that negative energy had no place in the decision process. As crucial as critical reaction time is required, having a logical and pragmatic solution must be placed in the forefront of the overall result. Don't let counterproductive emotions be in line with the journey you want to pursue. Take a deep breath, see the situation for what it is, and reply to the circumstances in the best of your ability. LOCATION: STRATCONA PROVINCIAL PARK. VANCOUVER ISLAND, BRITISH COLUMBIA, CANADA. "BEAUTY IS POWER; A SMILE IS ITS SWORD. "- JOHN RAY. Whenever I encounter a sense of inspiration or a moment of clarity, I get swept into the motions within the currents of the strength that lies behind the emotional conduit. Whenever I embrace the beauty of a physical or metaphysical entity, I become submerged in perpetual bliss that captivates my heart and mind. Whenever I confront beauty in its infinite forms throughout my journey in life, I fall in love with its boundless energy and unconditioned compassionate nature. The reality of comprehending the concept of beauty is a passage we must all partake. The lessons encompassed within the adventure can instigate practices of structuring our perspectives in a broader view. When that happens, you'll come to realize that beauty is embedded everywhere around you. The light of consciousness is nestled within the confines of our perception within the present moment. What we interpret directly translates through our neurological operating system. The information processes through the filters of what we've conditioned our mindsets to formulate and ultimately forges the response accordingly. The variations of thought processes all delineate from how you view your journey and the landscape that's related to it. Let's say you pessimistically construe an assumption from an event that's presenting itself to you; there's a tremendous probability your reaction to the juncture will receive little to no positive feedback. A negative mindset doesn't propel the act of reacting to beautiful moments proficiently. It creates an assortment of unfavorable notions to litter your headspace that robs you away from recognizing what you can become. When you condition your mindset to understand the elegance of what surrounds us, it'll become integral to attain the awareness necessary to see life for what it is. Only when the horizon of your perception throughout your journey expands can you appreciate what beauty has to offer. Our general understanding of beauty is established in a semi Concordia fashion. We know we can correlate our perception of beauty to peace and harmony, but we must also regain focus on the strength that courses through the energy. The ignition that incites the flames of inspiration can occur from experiencing the vitality of beauty. Be in sync with the energy that's inside of you. Make it an objective to engage with the elements that'll inevitably build the entity you want to become. Let the beauty inside of you be the light throughout your journey towards where you want to go. LOCATION: SPROAT LAKE. VANCOUVER ISLAND, BRITISH COLUMBIA, CANADA. "YOU CANNOT HAVE A POSITIVE LIFE AND A NEGATIVE MIND. "-JOYCE MEYER. Your body is the vessel and instrument to enacting action from the conscious being that conceives the preliminary thoughts. The neurological traffic that conducts raw information into emotional inspiration requires the mechanically physical asset that is your body. This understanding alone should incentivize practice of taking care of ourselves. While a portion of the population implements some form of physical training, not everyone retains the discipline to make this process a priority. What becomes more worrisome is while we place little to no emphasis on structuring a maintenance itinerary, we neglect another aspect of the light of consciousness that demands as much, if not more, imperative scrutiny, our minds. The condition of the cognitive infrastructure we call the human mind governs the state of the thought process embedded through its biological pathways. The variable outcomes the living being predominately engages into is from the influences it been conditioned to believe. If the societal landscape provides negative stimulus, the probability the host will be receptive to the energy is greater compared to an alternative setting. Exercise the notion of a positive space where happiness and love coincide to lay out the framework of your mindset, and I sincerely assure the results of the example would prove to bring promising results. That in itself isn't the remedy to rectify pessimistic perceptions, but it is the premise of where we can begin our journey of bettering ourselves. The complexity that facilitates the operating system that is our minds requires an exponential demand for attention when maintenance and exercise come to the fold. The way you can construe this concept is to imagine how difficult it would be to conduct any activity when you're functioning at a less than optimal state. The tasks become arduously straining on your phycological and physical being. Do you genuinely want to walk through the journey of the only life you have in a disposition that you can potentially control? Our mortality doesn't consider sympathy towards the complacency we apply to ourselves. The finite time we have on this plane of existence will end with or without our consent. We can't afford to waste our brief moment on this planet to negative notions coursing through our minds when we know an exceptional version of ourselves is waiting to breathe purpose into our journey. Take care of all that is you. There will only be one version of you that'll have the opportunity to experience the brief period of living and creating a legacy for future generations to attain inspiration. LOCATION: PACIFIC RIM NATIONAL PARK. VANCOUVER ISLAND, BRITISH COLUMBIA. "NEVER UNDERESTIMATE THE POWER OF DREAMS AND THE INFLUENCE OF THE HUMAN SPIRIT. WE ARE ALL THE SAME IN THIS NOTION: THE POTENTIAL FOR GREATNESS LIVES WITHIN EACH OF US." - WILMA RUDOLPH. When the light rises above the horizon, the colors of the landscape reflects into the visual spectrum, and the conscious entity reunites from its slumber to immersing itself in cognitive synchronization to the world, once again the pursuit of the journey to life begins. The vigorous fluidity of energy that's within ourselves is determined to exist within the plain of mortality. The very energy that motivates action to course through our bodies to attain what's important to each of us. It can invoke inspiration and determination that's required to scale our minds to grasp the mechanisms and skillsets to push forward. These very notions lie within the confines of the infrastructure that is ourselves. It has the power to conceive dreams. It has the power to reach purpose. The energy is who you are. The premise of expanding your perspective to understand what you desire in your journey of life starts when awareness engages in line with you. The concept of placing yourself as a priority has been conditioned in our civil societal construct as potentially selfish, self-centered, or narrow-minded. The practice of providing help for the individuals in your life is an act of gracious benevolent that promotes wealth in emotional attention and moral support. The complications arise when you invert your time for other individuals when you blatantly are suffering from various cases of mental and physical anguishes that create instability that'll eventually wreak havoc on you. I've encountered this very circumstance more times than I want to admit. One of the preliminary steps required in this situation is to see your current status for what is it, and then from that point forward, you can commence towards the trajectory of change within incremental decisions to start inevitably gain adherence to what matters to you. Submitting your attention to the building blocks of who you can become and creating the practice that'll solidify your progressional growth will eventually forge the stepping stones to recognizing what's vital for you and your dreams. Reach for the stage of clarity and continue pushing in line to connect to the entity that's waiting for the chance to see the light of day. It'll demand complete commitment and focus and every shred of the inner energy rushing inside of you. If you instigate the notion of reconditioning your mindset to discern what's important and what isn't, you're one step closer to preparing the mindset to correlate within an energy of unspeakable potential. Believe in the power within yourself and your dreams; it's amazing what can happen. LOCATION: PACIFIC RIM NATIONAL PARK. VANCOUVER ISLAND, BRITISH COLUMBIA, CANADA. My summer experience on Vancouver Island has been nothing short of breathtaking. The broad pallet of various types of landscape waiting to be explored creates a continuous source of inspiration for my imagination to pursue. When I venture towards the west side of the island, I know there's natural beauty waiting for wandering eyes to capture. On the southern part of the Pacific Rim National Park, there's a town called Ucluelet. My first impression of the area felt like I was walking on the shorelines of Nova Scotia. There are similar characteristics between the two landscapes, like the rocky shores, the lighthouse at the Amphitheater, and the small town appeal. When you head northbound into the Pacific Rim National Park, then the landscape takes a different turn. Tempermant rainforests, soft sandy beaches, and beautiful lakes give you the natural playground every outdoor adventurist would want. The last stop on this trip was passed the park's boundaries towards another small town called Tofino. 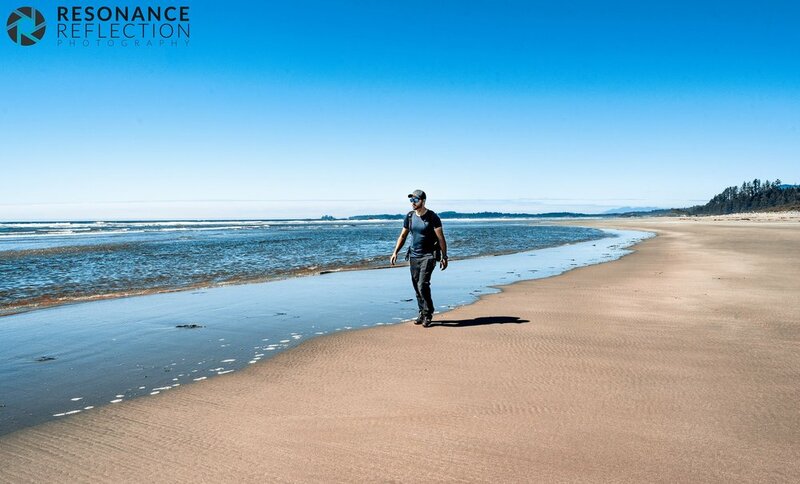 With a population of 1 876, the relaxed atmosphere amplified by the kind hearted locals offer an excellent way to end a tour off the western coast of Vancouver Island. We as a species have developed moral structures and ethical practices which has enabled the existence of the light of consciousness to prevail through all forms of adversities. The necessity of learning the skillsets to survive through challenging periods in our evolutionary process has enabled that information to be stored within our biological wiring. This imperative knowledge has created the bedrock for future generations to utilize for they own personal gains. We can learn from the efforts and mistakes our predecessors had to endure. The fact that we can find literacy from the past, speak to an entity who's experienced the changes our societal construct has gone through, and see fragments of civilizations through structures and monuments of a life once lived portrays a reminder of how far we've come. The reminisce of the past is an act of nostalgic pleasure but also a means of undiscovered passages to gain knowledge from beings that walked on this plane of life as we do now. The struggles within the growing pains society had to encounter in the past serves as a reflection of why we continue to question and revise the way we live. We are a diverse cultural infrastructure have devised various means of humanitarian procedures to accommodate the complex landscape we call love. The concept of placing an emotion as pure as love in the centerfold to our preliminary focus is more challenging than one might assume. We can open our hearts and share ourselves in any benevolent manner, but how we are conditioned to recognize these moments all vary on the premise of self-awareness and respect for each other. When you reach a point of understanding what you can offer to society, that's where the journey of attaining your goals has reached an immensely significant step. The continuation of our progress must become one of the primary objectives for the light of consciousness to sustain itself. The trials of trepidation will cascade on our journey as if they are strategically staged and waiting for our breath to hit its threshold. I personally recommend that you grasp the trying times and make the most out the situation. Your perspective dictates the interpretation of the outcome before it becomes coherent to the mind. Establishing the practice of doing good for your community and the world inherently solidifies the intention you place upon the people you care for most. Building your reputation to outline the motives for yourself and your goals lay the conduit for others to connect to your story and in return potentially inspiring others to follow their own journey. And be sure that you're doing this for all the right reasons. Be the best version of yourself. Be authentic. Be bold. Be a part of the beauty that surrounds us in the plain of life we're fortunate to exist.